Today’s sweet treat is a cross between the classic American snack, puppy chow, and one of many special cookies that my mom makes every year for Christmas. The happy marriage happened quite by accident. When my dad was in town, he went over to my aunt’s for her famous chop suey, which she always tops with crunchy chow mein noodles. Always the hostess with the mostest, she sent my dad back to my house with ample leftovers, including a huge bag of the chow mein noodles. Now, while chow mein noodles aren’t particularly nutrient rich, this brand is vegan and not horribly unhealthy either. Not one to waste food, I put my thinking cap on to transform them into a quick and easy snack, rich enough that one or two at a time will do you just fine. My mom’s Christmas haystack cookies are named as such because they include chow mein noodles bathed in peanut butter and melted butterscotch chips, resulting in a small heap that looks just like the perfect home for a needle. 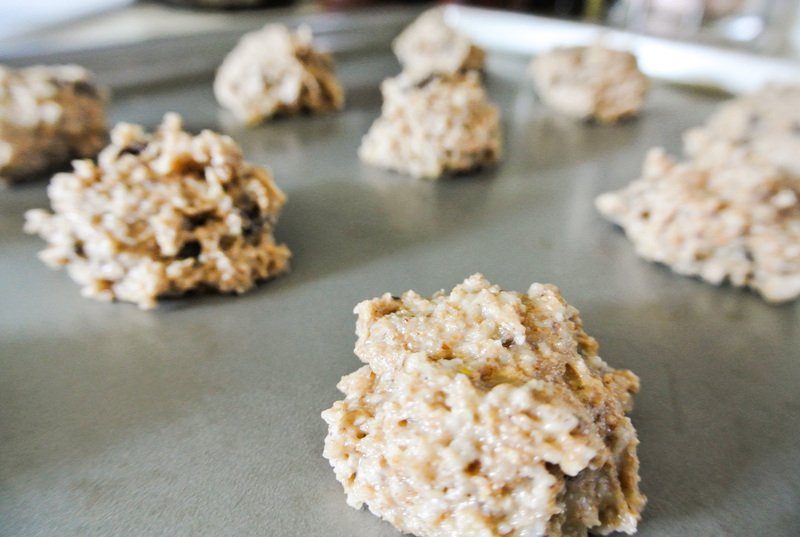 My intention was to replicate these—one of my favorite holiday treats she makes—the Fresh Formula way: vegan. There may be vegan butterscotch chips out there, but regardless, I didn’t have any on hand. Just a couple of days before inheriting the chow mein noodles, I stocked up on some 85% dark chocolate in bulk. I never tasted it when I bought it; the bitter smell alone told me that this chocolate was meant for melting and repurposing. Thus, the idea for dark chocolate haystacks—or as Nolan calls them, “spiders”—was born. You can substitute any nut butter and any meltable chocolate to make this recipe your own. You can also substitute any cereal—Chex is used in traditional puppy chow—crackers, pretzels, nuts, or chips for the chow mein noodles if you aren’t set on your heaps looking like hay. As long as the combination tastes fantastic, the shape and appearance of the clusters doesn’t much matter. The reason these treats ended up a cross between the haystacks and the puppy chow was because the 85% dark chocolate was much bitterer than I anticipated. I enjoy 70% dark chocolate regularly and thought that 15% wasn’t substantially higher…but no, it is! Even though, according to the ingredients listed on the bulk bin, there is sugar in the chocolate, I could barely taste it and practically puckered when I bit into the first haystack. Travis thought of puppy chow and suggested I toss the haystacks around in powdered sugar to compensate for the lack of sweetness. It worked enough for me—I’m so used to dark chocolate now that I don’t need my desserts oozing with sweetness—but Nolan said he would like “new spiders” with a little more sugar. 🙂 Lesson learned for next time. This is the type of formula where having a kitchen scale really comes in handy. I am getting better and better at eyeballing amounts and weights, but being precise is generally preferred in any recipe. Using a simple kitchen scale, you can easily measure out the ingredients for today’s haystacks. You could also toss your haystacks in or top them with chopped nuts, sprinkles, or any other garnish that would add to the appearance or flavor. You’ll love these yummy treats! Assuming your little ones aren’t irked by spiders, they are bound to dig in, too! 7 ounces unsweetened/minimally sweetened crunch (i.e. cereal, crackers, chips, pretzels, nuts, etc.) –> I’m using chow mein noodles. 12 ounces vegan chocolate (chips or bars) –> I’m using 85% dark chocolate bars. ¾ cup nut or seed butter (nuts/seeds only) –> I’m using a combination of peanut and sunflower. ¼ cup garnish (i.e. powdered sugar, sprinkles, chopped nuts/seeds, desiccated coconut, etc.) (OPTIONAL) –> I’m using homemade powdered sugar. Using a double burner*, melt your chocolate and nut/seed butter together over medium high heat, stirring occasionally. Once melted, pour the mixture over your crunch element and stir to combine. If the combination seems too runny, you can always add more crunch. Use a spoon to dollop small heaps of the mixture onto baking sheets lined with silicone baking pads or parchment paper. They will eventually solidify if left on the counter top, but the process is expedited in the fridge or freezer. Once solid, you can top your haystacks with or toss them in a garnish, if you wish. Store in an airtight container at room temperature. Nolan has decided that his favorite food is chocolate. “Chocolate is a good snack, Mom.” Nolan wants chocolate on or with almost everything he eats. Thankfully, his mama is hip to the word on dark chocolate, which is all he’s ever had. Like a lot of people, I grew up on milk chocolate, which I think most would agree is richer and more palatable. Dark chocolate is an acquired taste, but now that it’s all I eat, the rare instances when I have milk, my tastes buds are blown away by how cloyingly sweet it is. Why make the switch from milk to dark? Many milk chocolate treats contain sugar and milk as their primary ingredients when it is the cacao bean that contains the powerhouse nutrients. Once you get past the slightly bitter and certainly less sweet taste of dark, you can now consume chocolate that provides true health benefits. Dark chocolate that is 72% cacoa or greater is jam-packed with protein, fiber, and antioxidants. It is heart healthy and can boost brain power, too. YUM! Of course, like all sweets, we can’t overdo it with even dark chocolate. Cacoa does contain fat and when made into a chocolate bar, for instance, also contains added sugar. Point is, a little bit of dark chocolate every day—yes, I eat it every day folks!—is not only not going to hurt you, but will provide you with powerful nutrients. Opt for fair trade whenever possible. Today’s rendition of my power bars also incorporates a touch of pink Himalayan sea salt, which is loaded with minerals. A little bit is ok. 🙂 If I didn’t sell you enough on giving dark chocolate a try, Travis said that these power bars are one of the best things I’ve ever made. So, there’s that. Enjoy! 1 cup unsweetened dried fruit (without added oil) –> I’m using pitted medjool dates. ½ cup nut or seed butter (nuts/seeds only) –> I’m using sunflower. 2 tbsps natural liquid sweetener –> I’m using agave syrup. Extract and/or spices to taste (optional) –> I’m using 1/8 teaspoon pink Himalayan sea salt. Melted dark chocolate to pour over the top (which will re-solidify after chilling) –> I’m using 3 ounces of 72% cacoa + a sprinkle of pink Himalayan sea salt. *Double the recipe to make double the bars, or, to achieve thicker bars. Turn your whole grains into flour using your food processor or blender (my Vitamix has a dry blade pitcher). Then, combine the flour and your remaining ingredients, except the garnish. Run until a thick, pliable dough forms. You will probably have to scrape down the sides of the processor with a spatula at least once. Turn the dough out into a mixing bowl. Use your hands to combine half of your garnish (unless it’s melted chocolate) and to break up any clumps of dried fruit and/or butter. Firmly press the dough into an 8 x 8 pan lined with wax paper. Evenly distribute the remaining garnish, pressing into/pouring onto the top of the bars. To melt dark chocolate: Use a double boiler (not the microwave). Fill a sauce pan with about an inch of water and turn it up to medium high heat. Place a glass bowl containing your chocolate on top of the pan. Stir chocolate occasionally until it completely melts. BE CAREFUL OF ANY STEAM COMING UP FROM THE SAUCE PAN. Chill the bars for at least 2 hours before cutting into the desired size and shape. Store in the refrigerator. Notice that I didn’t title this post chocolate chip cookies? That’s because the chip concept—a true Fresh Formula—lends itself to way more than just chocolate. “Chips” can also include such yumminess as chopped nuts, seeds, dried fruit, candy, and even, shredded veggies (a la carrot cake, etc.). Obviously, some choices are healthier than others. Today, I’m making a classic chip cookie, inspired by a recipe from Thug Kitchen (you know I love these two vegan chefs!). 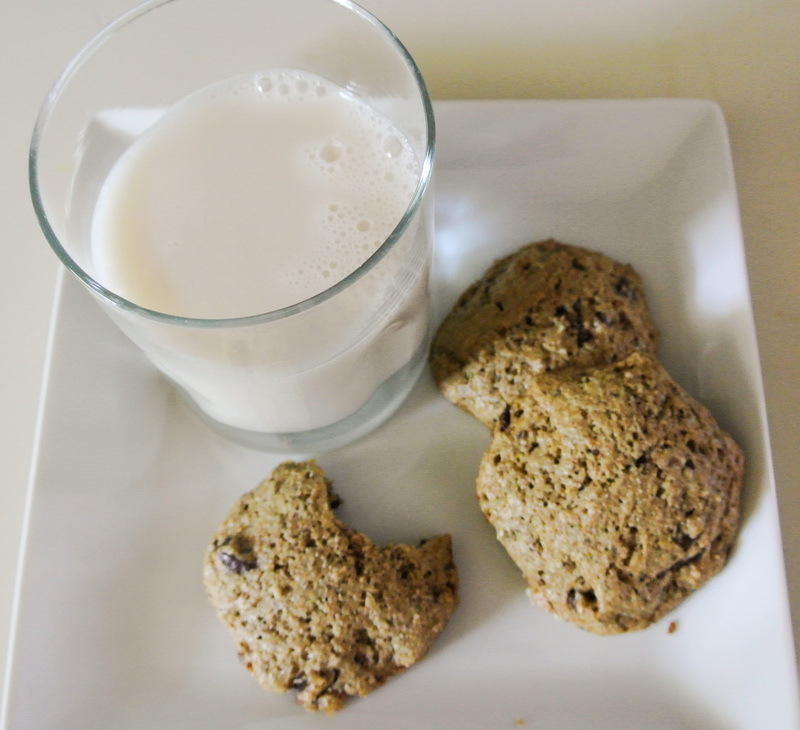 I’ve taken their chocolate chip almond butter cookie recipe and adapted it to a formula; not everyone likes chocolate, some people have nut allergies, etc. 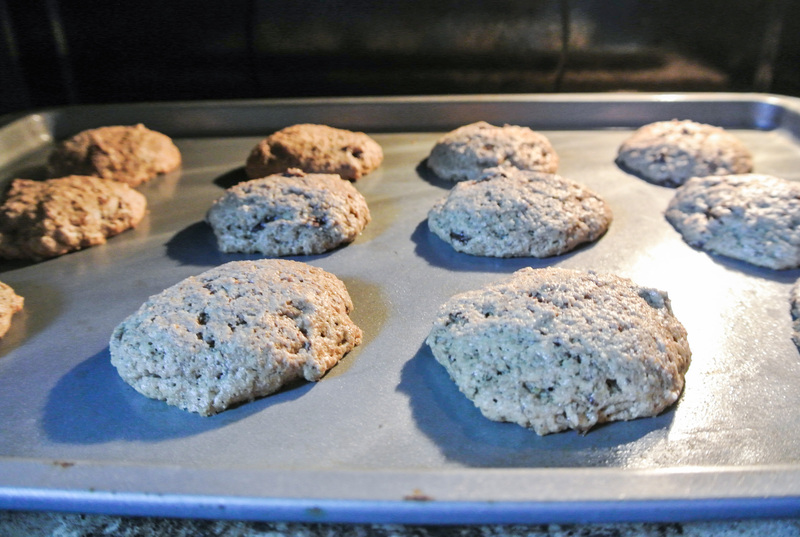 You could even make these cookies gluten-free. For my chips, I’m using dark chocolate covered ginger. Travis bought me a bag of these ginger treats at the beginning of my pregnancy. Ginger aids with nausea, just FYI. 🙂 Although tasty, they were the size of large malted milk balls; that’s just too much ginger for me to pop into my mouth at once. I’ve been hanging on to them in hopes of thinking of some other way to use them. So, I decided to chop them up and use them in lieu of traditional semi-sweet chocolate chips. The “egg” in this formula is made possible with ground flax seeds, although chia will likely work as well. I haven’t tried that, but let me know if you do! I did, however, make two batches of my new formula, trying different mixing methods with the exact same ingredients. The first time I made these cookies, I used an electric hand mixer to incorporate every single ingredient except the chips, which I stirred in by hand. The result was a deliciously smooth batter that made for thin, crisp cookies. The second time, I mixed the dough by hand, using the electric hand mixer only after all ingredients except the chips were mixed by hand, just to smooth it out a little. What resulted was a slightly lumpier dough and fluffier cookie. I also think that the density of the dough would differ if nut/seed butter were used in place of oil. Experiment until you get the cookie texture that you prefer. No matter what, these vegan delights promise to be delicious. Enjoy! 1 ½ cups flour –> I’m using whole wheat. ¾ cup unsweetened plant milk –> I’m using almond. ½ cup oil or nut/seed butter –> I’m using coconut oil. 2 tbsps flax or chia seeds –> I’m using flax. 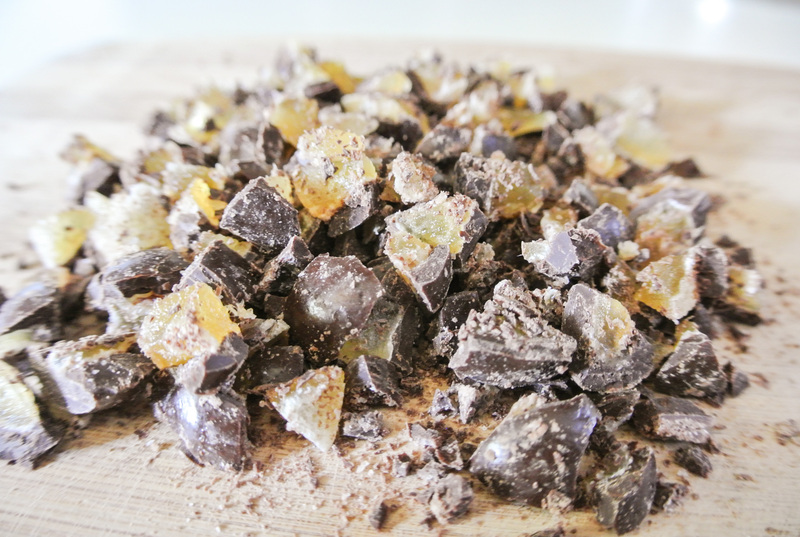 2/3 cup chips –> I’m using chopped dark chocolate covered ginger. *See my cake formula for an explanation of this sweetener. 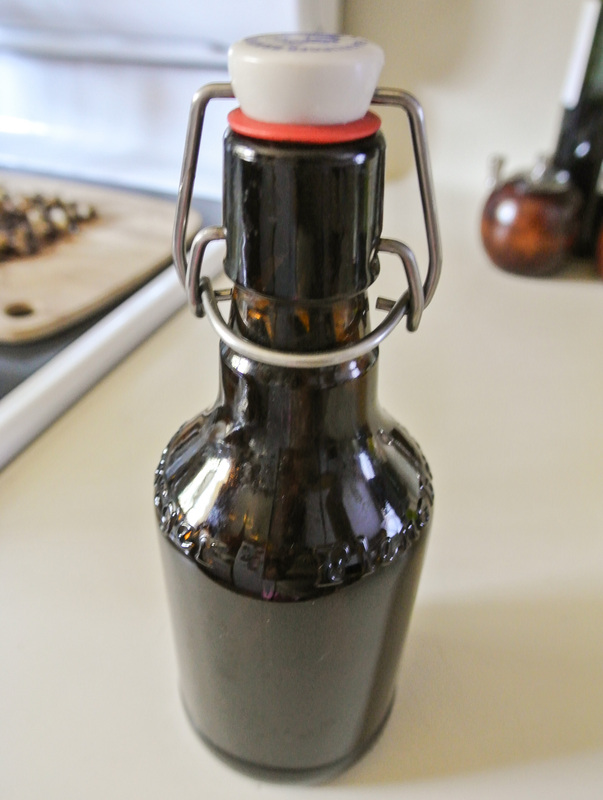 **Pictured below is the vessel that I use to bottle homemade extracts (another post, another day). Preheat your oven to 350 degrees. Combine all wet ingredients in a large mixing bowl. Slowly incorporate the dry ingredients, mixing as you go. Lastly, stir in your chips. Grease 2-3 baking sheets or line with parchment paper. Place heaping spoonfuls of cookie dough approximately a 1.5 inches apart. Bake 15-18 minutes, or until the cookie edges are slightly golden brown.